Mais – Scientific name: Zea mays L.
Coarse, erect, tall grass, 1-2 meters high. Leaves are numerous, 30-100 cm long and 2-10 cm wide, linear lanceolate. The individual fruit is is roundish or reniform, compressed, shiny. Anodyne, cooling, diuretic, alterative, demulcent, lithotryptic, emollient, stimulant. “Corn silk: – maizenic acid, 2%; fixed oil; resin; sugar; mucilage and salts. Grown extensively in the Philippines, in some places replacing rice as the diet staple. Good source of carbohydrates, B vitamins (riboflavin and thiamine), vitamin A and C, potassium and zinc. The embryo is rich in oild and used widely for cooking, manufacture of soaps. Corn syrup is used in the manufacture of jams, jellies and other sweets. Corn starch is well known for its many uses. Diuretic: Take decoction of hairs or cobs as tea. Decoction of pith of cob as tea is used for stomach complaints. The water in which unhusked corn is boiled is a pleasant tasting remedy for urinary tract infection. 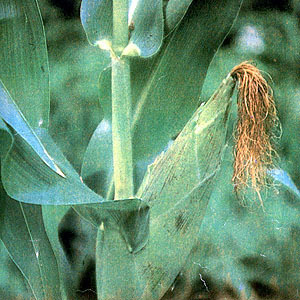 The corn silk decoction is also thought to be diuretic. Poultice used for ulcers, rheumatic pains and swellings. Decoction of parched corn (buned or roasted) taken as tea for nausea and vomiting. Kidney stones: Infusion of corn hair in hot water, 3x daily. Thanks for the urinary tract infection information. ngayon pa lang ako nagtry uminom ng nilagang buhok ng mais. wait lang kayo, kasi di ko pa lam effect.